Forty-three mortarium stamps were examined. Four fabrics were identified, with the highest number of stamps recorded in the 'local kiln' fabric (BUFM). Other sources were identified as Colchester (COLBM), Verulamium (VRWM) and northern France (NEGM). Full fabric descriptions can be found in the Fabrics section. Mortaria made at Colchester and those made elsewhere in Essex, including Heybridge, are difficult to differentiate and form distributions, and the stamps are necessary for any certainty. The fabrics for northern France are also difficult to isolate because the geology on either side of the Channel is similar. For instance, Q. Valerius Veranius and Q. Valerius Se-- almost certainly worked in different potteries, but both are in northern France. The stamps have been grouped and described by fabric and the local kiln products are grouped by stamp type, i.e. the name stamps are followed by the 'trademarks'. Note: When applied to mortarium stamps, 'right-facing' and 'left-facing' indicate the relation of the stamp to the spout looking at the mortarium from the outside. A large quantity of mortarium fragments had been built into pottery kiln 1618, in particular, the clay lining and the pedestal. It is assumed that these mortaria had been made nearby, and attention is drawn to the similarity in fabric and form between these vessels and others made locally, including Colchester. All of the stamps were impressed vertically down the 'collar' of the mortarium and in all examples the die has been applied in the same way with the name reading downward from the rim. In all, there are six to seven mortaria impressed with this stamp. Five to six mortaria had been used in the construction of the pedestal, 1578, but the fabric of all seven shows crazing to some degree, presumably the result of overfiring. It is interesting that similar fabrics made at Colchester, and sold in quantity to Antonine sites in Scotland, show crazing that looks similar, though in that instance it probably results from the acid soil conditions. One possible reading of this potter's stamps could be CVINO\[. ]M, (N reversed), but the interpretation is unclear. No other stamps from the same die have been recorded. Names beginning CVNO-- are common enough, but the only potter whose name, stamps and mortaria have any similarity to these, is Cunopectus, who worked at Colchester (Symonds and Wade 1999, 199, S28-S32). Cunopectus sometimes used Λ or Y for V and used a stamp border of generally similar type; a few of his mortaria can be matched among the Heybridge mortaria. There are, however, difficulties in reading these stamps as any version of his name, and the similarities in the lettering, are not close enough for us to assume that they are his. Any final decision about the reading must wait until a stamp is found that records the missing letter in full; if it is an upside down P, identification with Cunopectus would then be much more likely. If the stamps are not his, then they are the stamps of a hitherto unrecorded potter. In either case, the dearth of mortaria with stamps from the same die indicates that they represent a minor production. Sale was probably limited to local communities around Heybridge. The discovery, on a kiln site, of seven mortaria stamped with the same unknown die is adequate reason to believe that they were made there. Moreover, they are in an appropriate fabric and have appropriate rim profiles for the area. The fragments of the six mortaria used in the construction of the pedestal of Kiln 1618, nos 1-6, are clearly residual and pre-date the use of the kiln (assuming the construction of the pedestal to be contemporary with the building of the kiln). We may reasonably assume that they are wasters from the firing of an earlier kiln in the vicinity. The potters at Heybridge were making their mortaria in the Colchester tradition and their mortaria can be dated by comparison with Colchester products. The rim profiles used by CVINO\[..]M combine features of Cam 498 and Cam 499. All have the wide bead of Cam 498; nos 6 and 7 have its outward-going flange, thinner at the distal end, while the rest have the incurved flange of equal thickness demonstrated in Cam 499. Both types are among the latest types being stamped at Colchester (Hull 1963, and see 153, fig. 87, nos 1-4 and 13) and both forms are likely to have continued in production after the practice of stamping ceased. A date in the late 2nd century is most likely, perhaps around the period AD 180/190. This estimation is based on those rim profiles associated with stamps, which continued to be made after stamping ceased; also the complete absence from Scotland of potters like Cunopectus, Acceptus and, the perhaps slightly earlier, and much more common, Martinus 2. The fact that this die is not represented elsewhere indicates that the potter was serving a local market. Mortaria like nos 5 and 6 continued to be made after the practice of stamping ceased, so that his later work could be unstamped. The optimum date for his stamped mortaria is c. AD 170-190. There is no reason to suppose that these mortaria were stamped for a special reason. 2. Fabric BUFM. A second mortarium of similar type. Enough of the borders survive to indicate that the stamp is from the same die as No. 1, but only the last letter at the bottom of the collar can be deciphered; this could be M. Stamps 1 and 2 together show that there are plain zones at both ends of the letter panel. In fact, these two zones are part of the outer border which is just a plain panel surrounding the letter panel and its upper and lower borders with diagonal bars. Collation of the two stamps shows that the entire stamp is 50mm long and 21mm wide with the letter panel approximately 46mm long and 7mm wide. The length of the letter panel would fit with M as the only letter following the incomplete letter, giving CVINO\[. ]M, (N reversed), as a possible complete reading. 1615, Part of kiln pedestal 1578, Kiln 1618, Group 906, Area W, Period 4 Note: the stamps have been superimposed in Figure 316, forming a composite stamp. Thirteen 'trademarks' (Figure 316, no. 15) have survived; all are likely to be from different vessels. Two mortaria stamped with the same die have been recorded from earlier excavations at Heybridge (Wickenden 1986, 45, fig. 24, no. 199), and one from Brampton, Norfolk (unpublished). This potter's distribution was clearly limited and it is perhaps surprising that his work should be recorded from Brampton. There is of course an outside chance that he came to Heybridge from Brampton (or vice versa), but this possibility can only be considered when further work is done on the pottery found at Brampton. On all of his mortaria the stamp was impressed down the collar, all the same way round. Considering the nature of this trademark, such consistency suggests that the die was either made or marked in such a way that it could always be picked up the right way round. The same is implied for the die used for the name stamp, CVINO\[. ]M?, which was also impressed consistently. The 'trademark' mortaria, including earlier finds, are more consistent in rim profile than those of the named potter who shows slightly more variety in rim profile and perhaps an earlier tendency. There is, however, a notable general similarity in their rim forms and some of the named potter's profiles are identical with those of the 'trademark' potter (namely Nos 5 and 6). Production at about the same date is certainly indicated. The spout indicated by the stump on No. 3 (CVINO\[.]M?) could be of the type in common use earlier (Hull 1963, fig. 63, no. 9), while the spout of No. 10 (trademark), is especially indicative of late 2nd century production (Hull 1963, fig. 87, 'Pottery from Kiln 24', nos 2-3). Fragments from six mortaria with the trademark stamp and five or six mortaria with the name stamp were used in the construction of Kiln 1618. Since there is no indication of refurbishment to Kiln 1618, all of these mortaria must pre-date the use of the kiln. All were clearly at hand when the kiln was built and none shows signs of being weathered at that stage. The conclusion must be that they were fired in an earlier kiln situated nearby and that they had not been lying around long enough to suffer much weathering. These factors and the similarity in the work of these two potters suggest that they were working in the same workshop at Heybridge. The similarity of their work also points to contemporaneity, though two of the named potter's rim profiles, and probably the spout on No. 3, are marginally the earliest typologically. All the mortaria, however, belong to the latest period when stamping was being practised in this area; this is likely to have been AD 170-190, probably ending well before AD 190. Both potters could have continued making mortaria without stamping them. Both were serving local markets and this is what one would expect. Even the production of mortaria at Colchester must have been diminishing by AD 170-180 as there is no indication that the Colchester potters found another market to take the place of that in Scotland and the north-east of England. If the name stamp did prove to be a debased stamp of Cunopectus, a move on his part from Colchester to Heybridge would not necessarily have been the backward step one might at first think. Regalis of Colchester opened a workshop at Ellingham in Norfolk in exactly the same period, either to leave Colchester, or to increase a probably dwindling market (Hartley and Gurney 1997, 25-6). This potter's mortaria are now known from Braintree; Cambridge (2); Canterbury (2-3); Capel St Mary, Suffolk; Chelmsford; Colchester (up to 99); Corbridge (3-4); Gestingthorpe, Essex; Great Chesterford (3); Heybridge; North Ash, Kent; London/Southwark (6); Wallsend; Ware, and York. Martinus 2 has the heaviest distribution outside Colchester of any of the Colchester potters who stamped names on their mortaria. He also has the heaviest distribution in north-eastern England of any of these potters and his absence from Scotland is noteworthy. His activity certainly lay within the period AD 140-180, but the optimum date for his work is AD 150-170 (see Symonds and Wade (1999, 200-1) for further details). Stamps 28-31 (Figure 316) are from four different mortaria, all with herringbone stamps from the same die as Hull (1963, fig. 60, no. 30) and Symonds and Wade (1999, 208, fig. 4.27, nos S136-138). This was the most common of the herringbone dies used in the Colchester workshops. An example was found in earlier excavations at Heybridge (Wickenden 1986, fig. 24, no. 200). AD 130-170. Stamps 32-34 are from three individual mortaria, each with herringbone stamps from the same die as Hull (1963, fig. 60, no. 33) and Symonds and Wade (1999, 208, fig. 4.27, nos S148-149). AD 130-170. The herringbone stamps (Nos 28-36) are all on different mortaria, a total of nine. All can be attributed to the workshops active at Colchester in the second half of the 2nd century. Two other mortaria with this type of stamp, one from the same die as Hull (1963, fig. 60, no. 30) and the second from the same die as no. 29, were published from earlier excavations at Heybridge (Wickenden 1986, fig. 24, nos 200 and 201). The best date available for the potters' activity is AD 130-170, though production could have started nearer to AD 140. For detailed notes on the herringbone stamps produced at these workshops see Symonds and Wade (1999, 205 and 209); for basic illustrations see Hull (1963, figs 60 and 61). These stamps (Figure 316) appear to be of local manufacture, but are found infrequently in Essex. Besides Gestingthorpe, noted below, a roundel stamp has been recovered at Kelvedon (Rodwell 1988, fig. 96, no. 408). Both sherds have similar rim profiles, but are from different vessels. A mortarium of similar type and fabric with three circular motifs was found at Gestingthorpe (Draper 1985, fig. 45, no. 574). The Heybridge mortaria were certainly made by a single potter and the vessel from Gestingthorpe could well have been made by the same man. All three mortaria would best fit the period AD 170-200; they could certainly have been made at Colchester, though production at Heybridge cannot be ruled out. Not enough rim survives in either of the Heybridge mortaria to prove that there were no name stamps associated, but they cannot be assigned to a named potter. The use of a cluster of rosette stamps probably indicates that no name stamp was used and probably also that these mortaria post-date the practice of stamping. However, it is worth mentioning that Cunopectus, and one user of a chevron roller stamp, did sometimes impress one rosette not far from their normal stamp. Both worked at Colchester. The Heybridge and Gestingthorpe rosettes are from dies not used by either potter. These name stamps are from sources other than Colchester (Figure 316); Nos 39-40 are from Verulamium and Nos 41-43 from north-eastern France. No stamps from other sources were identified in the assemblage. Albinus worked at Colchester for a short time, probably early in his career, but, except for two or three of his mortaria, all are, like this example, in fabric characteristic of mortaria made in the Verulamium region. 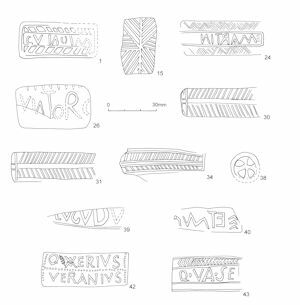 None of his kilns has been located, but counterstamps reading LVGD were being used in the period AD 55-75 by Oastrius in a workshop at Little Munden Farm, Bricket Wood (Saunders and Havercroft 1977), and by Ripanus at Brockley Hill. Brockley Hill is known to have been called Sulloniacae, so that Bricket Wood is still the best candidate for 'Lugudunum'. Albinus was the most prolific potter to have stamped mortaria in Britain (more than 420 mortaria recorded). His activity can be dated AD 60-90 and could perhaps have begun as early as AD 55. For further details see Symonds and Wade (1999, 198, S15 and 195, S1-S10). There are traces of neat gritting and scoring on the interior of this example, which suggests that it does not belong to the latter part of his career when this practice had been largely if not entirely abandoned. Stamps on both Nos 41 and 42 are on mortaria of Gillam (1970) form 238. Q. Valerius Veranius can be attributed to the Oise/Somme area of northern France (Hartley 1998, 200-6) within the period AD 65-100. See also Symonds and Wade (1999, 197) for a detailed note on this potter. Mortaria stamped with these ten dies have now been noted in France from Boulogne; Evreux (2); Rouen, and in Britain from Broxtowe, Notts; Camelon; Cirencester; Colchester (12); Corbridge; Dorchester, Dorset; Exeter; Godmanchester; Heybridge; Kettering, Northants; London/Southwark (11+4 (provenance uncertain)); The Lunt, Baginton; Richborough (5); Silchester; Springhead, Kent; Usk; Verulamium (3); and York Museum (provenance uncertain). A further mortarium has also been dredged from the sea (Whitstable Museum). Stamps from the eleventh die with the longer version of the name are known from Gloucester and London; in addition, there are three others from a twelfth die that may be his (Colchester (2) and Lincoln). Ten stamped mortaria of Q. Valerius Se-- were found in a Boudiccan destruction level at Colchester (Dunnett 1966, 46-8). These mortaria were part of a store of twenty to thirty, or more, unused mortaria, some probably never stamped. All are very nearly identical and can be attributed to the same workshop. The Usk mortarium is from the fortress period (Hartley 1993, 426; fabric 11). There is no doubt of his pre-Flavian to mid-Flavian date, within the period AD 50/55-85. His work can be attributed to an unlocated workshop in the north of France. See Hartley 1998, 206-8.